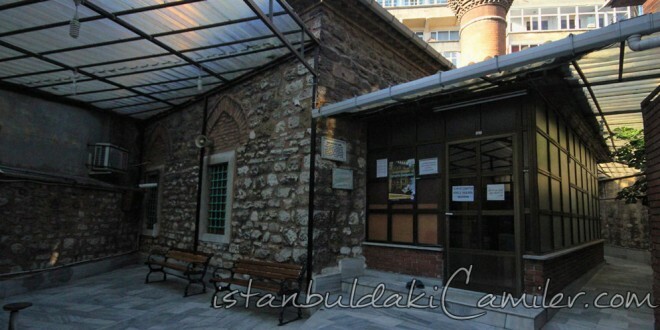 The benefactor of the mosque, which is also called as the Masjid of Kazganci or Kazgani Sadi Mosque, is Sadi Mehmet Effendi who was head coppersmith of Fatih Sultan Mehmet. It is stated in its foundational records that Sadi Mehmet Effendi covered the expenses of the construction of the mosque that was built by the people of the vicinity. The mosque that was demolished in 1918 in the great Istanbul fire remained in ruins for years until it was rebuilt by a beneficent person under the supervision of the Administration of Foundations and it recommenced serving the believers in the year 1971. The mosque has a square plan with walls made of stones and bricks. Its roof is covered with tiles. It has a single minaret with a single balcony. Its minbar and dais are made of wood. Inner wall skirts and the mihrab of the mosque are decorated with encaustic tiles. The mosque also has a small graveyard where the benefactor also rests.